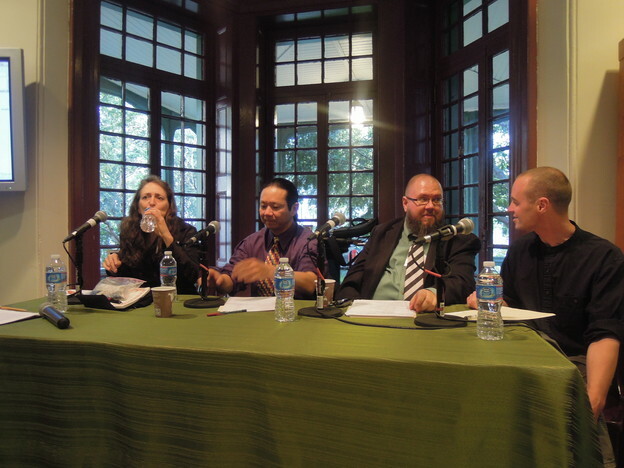 Maria Damon, Steve Yao, Brian Reed, and Craig Dworkin at Kelly Writers House, April 2012. This feature is a companion to Poetry Communities and the Individual Talent, a conference that took place at the Kelly Writers House at the University of Pennsylvania on April 13–14, 2012. The feature includes versions of papers that were given as part of the conference, reviews and commentaries related to the conference, as well as articles, reviews, and interviews that relate to poetry and community more broadly. M. NourbeSe Philip. Photograph by A. L. Nielsen. Recently the Canadian Caribbean poet M. NourbeSe Philip has begun to experiment with collaborative public readings of her book-length poem Zong!